When you teach in China, I have already noted that the greatest resource you have available to you are the other teachers in the office. But who is going to be the biggest support, well that is your Teaching Assistant. Each class is assigned a foreign teacher and a Chinese Teaching Assistant (T.A). Make sure you are on good terms with your T.A, they are so vital to you being a good teacher, and for being understood. The main role of a T.A is obviously to help support you in your lesson, help with translations, explaining complex grammar points to make sure students can understand it, when you are busy too step in and help, write points on the board, and most importantly to be able to go between the parents, students and yourself. The T.A is an extension of you in the class, and out of the class, they go beyond what we do. Sometimes I would not want to be the one to tell a parent that their student has been naughty, or may need to do a restudy. The T.A is so vital to your class, that you have to make sure you appreciate them. You soon notice when they aren’t in the class! For the younger classes the T.A’s are present in every class. These classes are all Kinder classes, Starter Classes (Seniors and Juniors) and 1A and 1B classes. After these units, when the students go into Level 2, the T.A only comes to every other class. When I made the transition for my 1B class to the 2A class I keenly noted the lack of support. 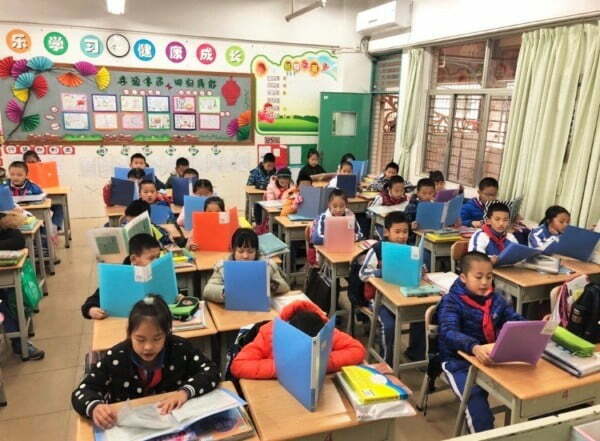 The students might stare at me with blank faces, and their limited English and my limited Chinese left me trying to resort to extreme measures, including TPR, Charades, using smart phones, and also having the Chinese written on a piece of paper beforehand then me trying to reproduce that Chinese either in pinyin or in writing on the board. I then made it a point to teach all the children different aspects of English – classroom English, like “Do you understand?”, “Can you explain it to me?”, “One more time?” and so forth. It is always advisable to do this from the beginning. Another key part of being a teacher is classroom management and discipline. With a T.A in the class it is like having a pair of eyes in the back of your head, an extra hand, and an extra voice. I have spoken with my T.A’s for all of my classes, and asked them if they could help me with corrections if we are doing a group task, and I obviously will not be able to listen to all 16 students at once, or in a game when we are doing relays. I have my T.A’s making sure that the students are paying attention if I have to turn my back for a moment, to say, write something on the board. I swear as soon as your back is turned, anything can happen! Also, when you are talking to a group of students, the T.A is making sure everyone is on task. I ask that the T.A’s help, or focus a bit more attention on weaker students, that may not be able to speak up as much as the more confident children, or may say that they understand something when they don’t. The T.A can pick up on this as well, and help you to make sure that they grasp the grammar or the vocabulary being presented to them. Whilst the T.A’s play a pivotal role inside the class, most of their work goes on outside of the classroom. They help with relaying homework to absent students, improving weaker students English, spend extra time with students, explaining things further, talking with parents, arranging all the information sheets for change of times, or holidays, or anything that may be happening. They mark tests for you, and basically do all of the extra paperwork that you don’t do. T.A’s put a lot of effort into each class outside of the class time. I have 6 classes, and 6 different T.A’s. I try to make it so that I talk to each T.A about how I think the class is going, how they think the class is going, what needs to be worked on, which students may need extra help, or what may need to be gone over again. Whilst you are the teacher, it is important to listen to the T.A’s as they will be able to help you to improve your style to suit each class so that the students are able to gain the most from every lesson. Whilst the T.A’s may be easily overlooked, they are one of the strongest parts of a classroom. The children and parents are able to build a rapport with them, and they are there to help you, so listen to what they have to say. If you have any problems or concerns they will listen and try to help you to resolve them, or do their best to resolve them for you. Furthermore most T.A’s aren’t just your Assistant, they quickly become your friends too, and can help support you whilst you are living in China. I am living in Pudong while my husband is here on location for Shanghai Disney we will be here for the next year. I would love to volunteer as a teacher aide I have 25 yrs experience in childcare and I love children. Please send me an email if your interested.